Why is it when I want a fast card I end up with one that takes a bunch of time and isn't exactly simple to make?? I had this thought slowly working through my mind and I finally got it made! 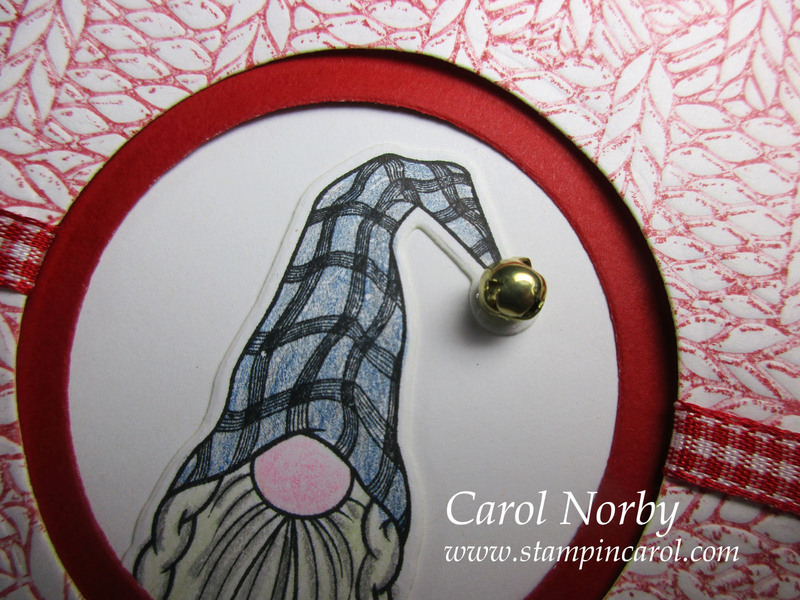 I used the adorable "Gnome For The Holidays" stamp set and coordinating die (Click on the links to see in the store.) These have been SO popular that the die set is out of stock at this time. I wasn't a gnome person until FSJ came out with this set in August. I inked the label side of the Cozy Knit embossing folder with Cranberry Bliss ink before embossing a piece of Whip Cream card stock. Didn't the background turn out cool? I tried real hard not to move the card stock when I put it in the embossing folder but there was still a bit of movement. I used Snapshot Frames die set and cut the Joy 4 times. 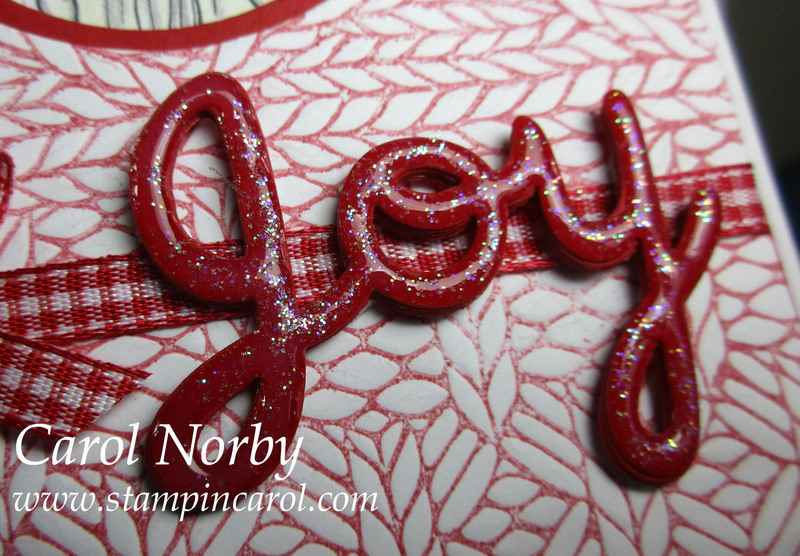 I glued them together to get some dimension then coated with Journey Glaze and a pinch of Sparkle Dust. 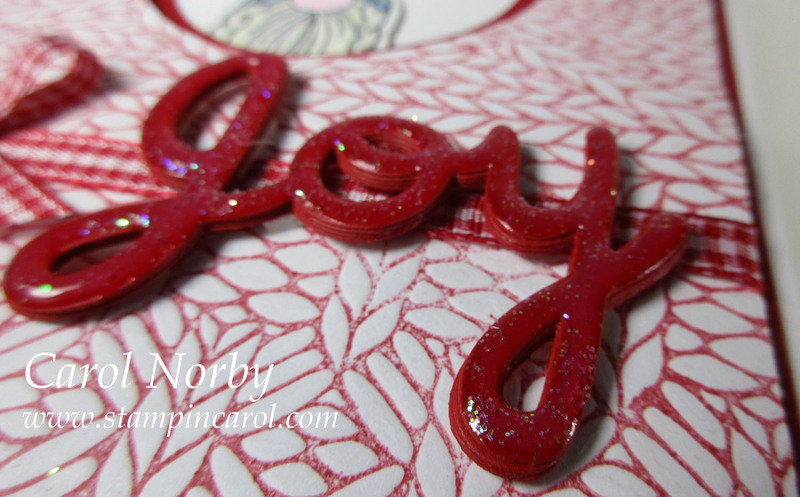 I die cut 2 sizes of circles on my embossed layer and Cranberry Bliss layer then adhered my stamped and colored little guy. He's adhered to the back of the Cranberry Bliss layer to be sure I got him placed right where I wanted him. I used Foam Squares between the 2 layers. The ribbon is from my stash.